for his first major win. LOUISVILLE, Ky. - The question came at the midpoint of the 30-minute press conference at the PGA Championship. "Over the years, Irish golfers have frustrated you in the majors. Padraig twice, and more recently, Rory. If you're in contention on Sunday evening, would you rather there were no Irish guys anywhere near you on the leaderboard?" Laughter erupted. Even the 34-year-old tour player sitting on the podium chuckled. It happened to be Sergio Garcia. "That's an interesting point," Sergio said. "You know I wish I could blame it only on the Irish guys." After coming onto the PGA Tour with so much talent and fanfare at the age of 19, Garcia is still looking for his first major victory more than 15 years later. Today, at Valhalla, his demeanor and words seemed to show that he is in a better place, with a more accepting attitude, about whatever failures and disappointments he has suffered in major championship golf. "I've been close two or three times with Tiger and he's come out on top," he continued, "and, obviously ... with Padraig and then Rory lately. But no, it's just the way it is. You can look at it different ways." Sergio is taking the positive view these days. It seems to be working. He is playing very well, nearly winning last week until a red-hot Rory McIlroy overtook him on Sunday. While Valhalla is not his favorite championship course, his fine long game and rejuvenated putting make him a contender. Another question: "Are you happy because you're playing well or are you playing well because you're happy?" "I think a bit of both," Sergio replied. "I feel like things around me are right where I want them to be, and that obviously puts me in a nicer situation when I go onto the golf course." 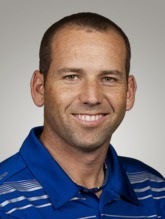 Maybe this week will finally be a "major" breakthrough in the career of Sergio Garcia. His name on the Wannamaker Trophy. That would make him even happier.